The push to prioritize prosecuting illegal border crossers has begun to impact the capacity of federal prosecutors to enforce other federal laws. In March 2018, immigration prosecutions dominated so that in the five federal districts along the southwest border only one in seven prosecutions (14%) were for any non-immigration crimes. But by June 2018, this ratio had shrunk so just one in seventeen prosecutions (6%) were for anything other than immigration offenses. See Figure 1 and Table 1. Federal prosecutors are responsible for enforcing a wide range of important federal laws - designed to combat narcotics trafficking and weapons offenses, battle those polluting air and water, counter corporate and other schemes to defraud the public, and much more. There is a combined population in these five southwest border districts of close to 30 million people. However, the number of prosecutions for committing any non-immigration crimes dwindled from a total of 1,093 in March 2018 to just 703 prosecutions in June 2018. Unless crimes are suddenly less prevalent in the districts along the southwest border, the odds of being prosecuted for many federal offenses have declined. The declining number of prosecutions has already begun to show up in the Southern District of California, in New Mexico, and in the Southern District of Texas. Comparing prosecutions month-by-month for the last three years, June prosecution numbers covering all non-immigration offenses were below levels recorded for the same period in each of the two previous years. See Figure 2. Next to illegally crossing the border, historically the next focus in terms of the volume of cases has been for drug crimes. Here, there are signs that even the work of Customs and Border Protection (CBP) may have shifted in some sectors away from pursuing cross-border drug offenders. For example, in Arizona the number of drug prosecutions that typically Customs and Border Protection agents are responsible for handing (under 21 USC 846) was down. See Figure 3. The number of families arrested by the Border Patrol showed little indication of materially dropping. Numbers have remained quite similar during April, May and June. This meant that Border Patrol officials still had to pick and choose which adults to refer to federal prosecutors, and which adults not to criminally prosecute. See Table 2. 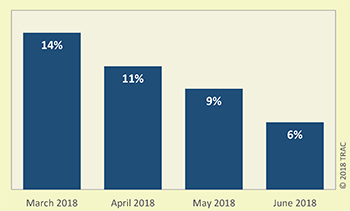 Thus far this administration's stepped up enforcement and family separation policies ( the latter continued until June 20) have not had an observable impact on the number of families caught illegally crossing the border. 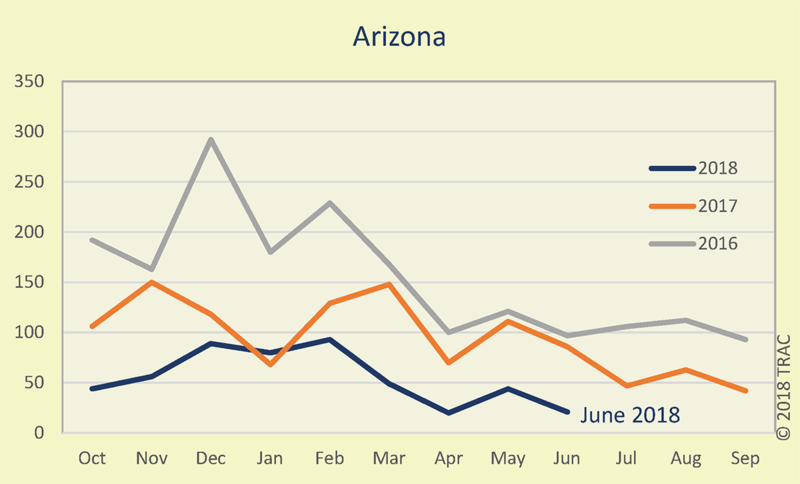 This is somewhat surprising since normally numbers illegally crossing the southwest border increase in the spring and then as the hotter months arrive, their numbers decline. Indeed, June saw a modest decline in the number of unaccompanied children and adults without children who were picked up. Only family units bucked these normal trends. This increase follows Attorney General Jeff Sessions' April 6, 2018 announcement, of a "zero-tolerance policy" for those who "illegally cross over our border." 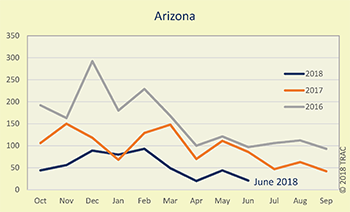 See TRAC's analysis of case-by-case Border Patrol apprehensions, and its reports monitoring the implementation of zero-tolerance policies as of the end of April, and through the end of May.